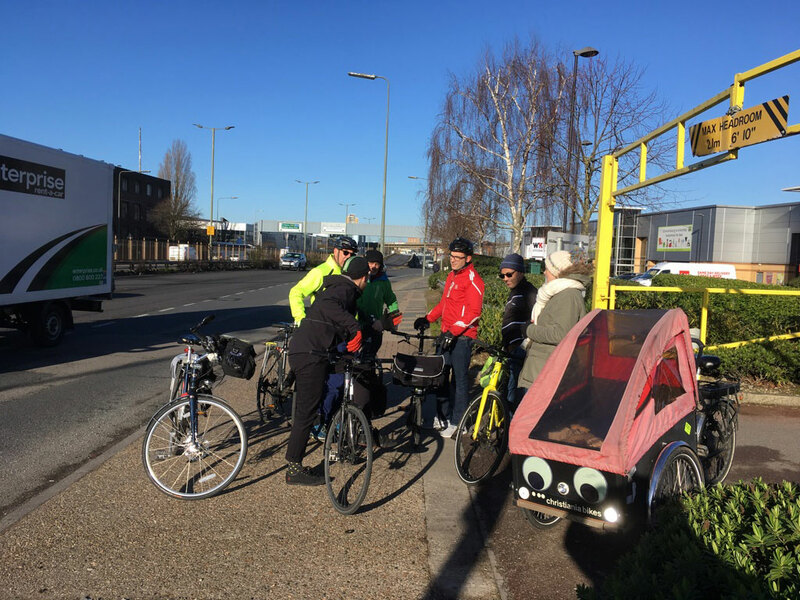 On Monday 28 January 2019 Will Norman, the TfL Cycling and Walking Commissioner, was good enough to come on a short bike tour with us, prior to a meeting he was due to have with Brent Council. We concentrated on showing him the problems that cyclist face in attempting to cross the North Circular Road in Brent, though we also took in some more pleasant environments as well. Another TfL officer, Will Bradley, was also with us, and we met Cllr Shama Tatler, Brent’s Lead Member for Regeneration, Highways and Planning, at the beginning of the ride. Cllr Neil Nerva did the first half of the ride. The route of our ride may be viewed on Google maps. Starting from the Civic Centre, we cycled up Olympic Way, pointing out that the only ways it is possible to get out of Wembley Park are N or W, as it is entirely cut off to the S and E by railways with no bridges, and by the inhospitable North Circular Road. Though Olympic Way is currently a construction site, parts are in their final form, with no specific space for cycling marked (a thing we have asked for but which has been refused by the developers, Quintain). This means that cycling here is tolerated, but not properly planned for, encouraging conflicts with pedestrians. Climbing up the ramp on to the west side of Bridge Road, we then made a right turn into Chalkhill Road. This is one of the better (unsigned) cycle routes in Brent, owing to effective mode filtering. However, it is difficult to connect to it from the Wembley Park development area as the tube lines are in the way, and the only connection is the hostile and inconvenient Bridge Road. We pointed out where Sustrans have previously suggested a new cycle/ pedestrian bridge across the lines, at Chalkhill Park, and where we have suggested an alternative location, at Chalkill BMX Track (adjacent to St David’s Close). Continuing via Barnhill Road, we passed through the mode filter approaching Neasden Lane North, which is regularly blocked by illegal parking. Here we could demonstrate the problem of getting to the other side of Blackbird Hill. There is a Toucan crossing by the Lidl store, but to get to it from Barnhill Road, you need to pull out into the often congested and heavy, and at other times fast, traffic on Blackbird Hill (4 lanes), get round a bus if one is stopped there, only to pull on to the pavement immediately to use the ‘jug-handle’ path provided to access the crossing. Before Lidl built their car park up to a higher level, it had been possible to cycle though this. It was a sad failure of Brent Council not to have acquired a strip of the car park in order to make a linking cycle track as a planning condition for the work. This, we pointed out, is symptomatic of the historic disconnect between transport and planning policy in Brent: the need for space for a facility here had often been pointed out in the past, sometimes in studies funded by the Council themselves. The Toucan lights on Blackbird Hill take 120 seconds to change after the button in pressed: giving cyclists and pedestrians a very low priority. Getting across, we accessed the Old Church Lane cycle track, a short contraflow facility originally planned by Brent Cycling Campaign. Sadly it was later disrupted by the building of a driveway for flats on the site of the old Blackbird pub, and never perfectly restored, though it can be used. Old Church Lane itself, we pointed out, is a tiny road that should be filtered. It provides an entirely unnecessary alternative to through-traffic that should use the B454 Church Lane. Cycling up Old Church Lane, we passed the road closure (not a proper bike-permeable mode filter) in Old St Andrews Mansions, to turn right into Birchen Grove. Here, we recalled, would be a good location for the construction of a path, bridging the River Brent, that would enable walkers and cyclists to connect between the open spaces north and south of the Welsh Harp reservoir, without having to go via busy and polluted Blackbird Hill. Campaigning for this has made no progress with the split responsibility of the land around the reservoir between Barnet Council, Brent Council and the Canal and River Trust. At the north end of Birchen Grove there is a choice of two paths across the Welsh Harp Open Space. We use the left-hand one, as the other is muddy in winter. The left-hand one is really too narrow for both walkers and cyclists. The utility of this open space could be improved by improving these paths. Both lead to Cool Oak Lane, which is a narrow, fast rat-run, though marked as a London Cycle Network route. Cool Oak Lane bridge is so narrow that pedestrians have to press a button to allow them to walk on the road. Making the right turn into West Hendon Broadway (A5), we cycled over the flyover that goes over Staples Corner West junction. This highly dangerous manoeuvre, involving crossing a lane of fast traffic heading down on to the roundabout, and another on the other side coming off it, is, as we pointed out, the best current legal option for cyclist going north to south on the A5. The roundabout at the lower level is even more dangerous, and, in any case, is scheduled to be removed under the Brent Cross redevelopment plans, with no sensible facilities for cyclists on the A5 planned in its place. (A plan for seven successive Toucan crossings just to go straight on on the A5 cannot be counted a sensible). The massively important desire line for cycling of the A5 (recognised as such in TfL’s Strategic Cycling Analysis (2018)) in an area of high future population grown has to be made safe through this junction, and nothing so far proposed as part of the Brent Cross regeneration will achieve this. Brent Cycling Campaign has been campaigning on making Staples Corner West safe for 35 years (is this a record within LCC? ): see the letter below (courtesy Bob Davis of the Road Danger Reduction Forum) dated 1985. This letter was in response to a cycling death here that year. In the 35 years since, no changes to benefit cyclists have been made to this lethal road layout. We suggest a solution similar to that built at Bow roundabout on Cycle Superhighway 2. We turned right off the A5 at the next traffic lights, on to Dollis Hill Lane. This is the first through-route E-W south of the North Circular, and is a bad rat-run. TfL’s Cycle Quietway 3 terminates at the north end of Gladstone Park, nearby, but has no means of taking cyclists further north, owing to the North Circular severance problem. The next Quietway proposed for Brent, running from Wembley Park to Harrow, will have no connection to Quietway 3. Other than Staples Corner, the only other method of crossing the North Circular east of Wembley is via the horrendous Neasden junction, which we tackled next. Tuning right at the end of Dollis Hill Lane, we negotiated the multi-lane south Neasden roundabout, and headed into the Neasden Underpass, the concrete canyon that carries the A4088 past Neasden Town Centre. This means avoiding being cut up by a fast stream of traffic filtering off to the left to get on to the North Circular westbound, and then, though the underpass, getting across the stream of fast traffic filtering off the North Circular eastbound. Having accomplished this, we stopped to discuss possible solutions. A proposal to link the Quietways, from a study funded by TfL, using an I-shaped bridge construction to simultaneously replace and link two existing footbridges across the A4088 ‘canyon’ and bridge the North Circular at a high level for pedestrians and cyclists, has been rejected as ‘not having a strong enough business case’, in correspondence we have had with Will Norman. We believe this solution would not give very direct, useful links for most journeys in the area anyway. Our preferred solution, utilising Neasden Lane North and Neasden Lane, but reconstructing the existing shared Neasden pedestrian subway to make it suitable for cycling, and making other changes to the traffic systems on either side, was outlined in our Cycling Plan for Brent (2013). Whatever the solution, this appalling lack of even remotely safe or inclusive cycle infrastructure to facilitate a crossing of the North Circular between Wembley (Harrow Road) and Golders Green (Brent Street), a distance of 4km, cannot possibly be tolerated in a city aiming to become, in Sadiq Khan’s words, ‘a byword for cycling’. Visualisation of the cycle/pedestrian bridge proposed across the North Circular at Neasden in a 2016 study funded by Transport for London. Turning left into Aylesbury Street we cycled another quiet section, into Chesham Street, Quainton Street and St Lawrence Way, finding the small path off Cambridge Close that is provided with a small and rather awkward bridge across the River Brent. If these paths were improved and the tight corners were removed, with improved sight-lines and lighting to aid social safety, this could be a useful cycling connection. A first step would be to remove the overlapping barriers, which made it difficult to get our test cargo bike through. We were then able to rejoin the Barnhill Road and Chalkhill Road route up to Wembley Park. Rejoining Bridge road, we pointed out the difficulty of getting back down on to Olympic Way from this side of the road. Barriers alongside the road corral pedestrians here, opposite the tube station entrance, and make it necessary to walk a bike, but there is hardly space to get through. There is no cycleable connection to North End Road or Olympic Way. Steps block the former, and an extraordinarily inefficient and awkward switch-back ramp impedes the latter. The cargo bike had to be pushed here. There are, seemingly, no plans to improve this ramp, despite the vast sums being spent on redevelopment of Olympic Way by Quintain (but they do seen to have money to convert the ‘pedway’ ramps leading into the stadium to steps, for their own reasons). Brent, in the meanwhile, has plans to make North End Road into a new through road for cars. This, in our view, would be a highly retrogressive step. Returning to the Civic Centre via Olympic Way, it was also worth mentioning the inappropriate low priority given to the very high pedestrian flow on Olympic Way at the junction with Fulton Road, where temporary Pelican crossing lights give a very small number of vehicles using Fulton Road almost all the signal time, and most pedestrians cross on red consequently. The installation of these lights was a response to an incident where a cyclist was injured in 2016. Fulton Road is closed on stadium event days. We believe it should be permanently closed. Will Norman clearly had some understanding of cycling and walking issues of the area before the ride, and he took on all our points and information, with a good, frank exchange of views on what was desirable and, in the foreseeable future, practical and affordable. He did appear shocked by actual experience of cycling some of the main road junctions in Brent, which were, he admitted, some of the worst places he had ever cycled. We know that to even start to tackle these issues will require long-term cooperation between TfL, Brent Council, adjacent councils, such as Barnet, developers, and other landowners, such as the Canal and River Trust. We really hope we don’t have to campaign for another 35 years before anything is done. This is the illustration of the problem the NCR creates for cycling in Brent and Barnet that Brent Cycling Campaign produced in 1984! We have seen no improvements since.